The following is a list of the suggested minimum donations for these items, including all postage and packing. There is also a leaflet that includes a membership application and donation form. Even if you feel unable to make a donation, we thank you for visiting our web-site and hope that you may one day pass by the Badges in the Chalk and stop and wonder at them. 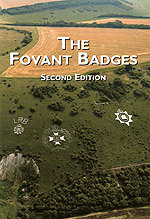 If you visit the badges you can obtain a copy of the booklet from Fovant Stores on the High Street, just off the A30. Or you can use the Contact page to request a copy.